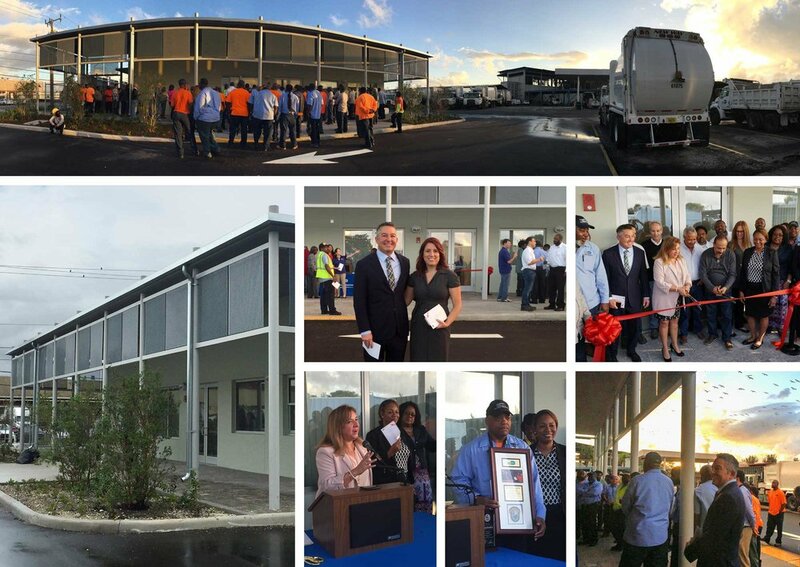 On Friday, February 16, Mrs. Alina T. Hudak, Deputy Mayor of Miami-Dade County, cut the ribbon on Miami-Dade County’s Solid Waste Management (SWM) Department’s first ever LEED Silver building designed by TSAO Design Group. “You have designed a beautiful building and should be very proud,” stated Mrs. Hudak. During this ceremony, Christopher Cummings, a Miami-Dade waste-collector was recognized for his heroic efforts last year when he rescued a Miami-Dade Police officer who was injured in a car crash. Miami-Dade SWM Department is an integral part of the community and provides waste collection and recycling services to more than 300,000 households in unincorporated Miami-Dade County and nine municipalities. This facility provides the department with offices, shower facilities, locker rooms and assembly space to best serve Miami-Dade County. The administration building is located at SWM Department’s North East Transfer Station near I-95 and Miami Gardens Drive. The building boast solar panels, rain-water harvesting, and a hyper-insulated building envelope, among many other sustainable design measures. TSAO Design Group is a full service Architecture and Design firm located in Miami and San Francisco, providing services to both public and private sector clients.